HomeBusiness SolutionsDigital twin technology; a promising call for businesses. What is Adaptive security architecture and how can it benefit the organisations? It is said, “Sometimes miracles come in pairs,” and exactly same happened in the unparalleled and unconventional land of technology. 2017 is marked as a year of success when the digital twin technology again ramped up after 15 years of hard work and dedication. Blown a new life by the Internet of things, this technology has now really become cost-effective to implement. The technology has become an imperative part of the business world to such an extent that it has been announced as one of the Top 10 strategic technology trends for the year 2017. It is simply a mind-blowing technology which has combined machine learning, artificial intelligence and software analytics with data to create a living digital simulation model which receive the changes and updates as per the existing physical counterpart. A digital twin is just a virtual model of your product, service or process. By combining physical and virtual world together, this technology really helps in avoiding the glitches and problems that used to occur before. It monitors the systems, analysis the data and thus gives us the opportunity to plan for the future ahead by making use of simulations. 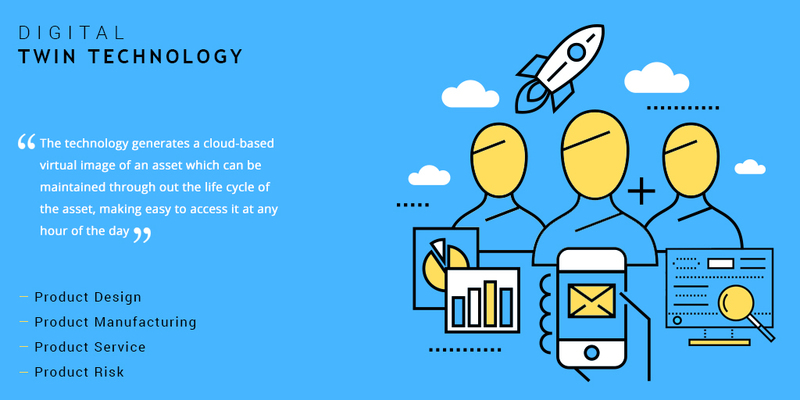 The technology generates a cloud-based virtual image of an asset which can be maintained through out the life cycle of the asset, making easy to access it at any hour of the day. It further allows all the experts and engineers to come under one roof and work cost-effectively on the asset, reducing the chances of errors and inefficiency. It involves smart components integrated with the physical item which makes use of sensors to gather data about real time status, working condition or positioning of that item. The components are then connected to a cloud-based system that has the responsibility of receiving and processing all the data that the sensors monitor. This input is then analysed against business and other contextual data so that a call for that physical item can be taken. This final call can then be implemented on this digital twin to see how the same would work in the reality. Thus, this technology results in a more safe, profitable and sustainable operation environment. How exactly can it help in business? Product Design: As the physical product transmits the data, the analysis of this data can really help in designing the product right. A logical decision can be taken about the material, performance, compatibility, serviceability and other such features of the product. Thus, arming the business to deliver more value to customers. Product Manufacturing: Despite the best designing and engineering, hurdles can come while manufacturing a product. Here, digital twin helps in identifying the pesky production problems like an error in the functioning of the components or an error while assembling these components. By correlating this smart data with digital twin, defects at production level can be eliminated quickly. Product Service: With Digital twins, businesses can deliver better product services. They will be able to predict the failure of the machinery part and thus proactively initiate the service call, further prevent the costly unplanned downtime of the customer. Product Risk: From history and experience, it can be said that risk management is really a daunting task. The famous example of Takata airbags failure and the following recall of cars was indeed an image spoiling incident for the brand. But with digital twins now, businesses have much more reliable ways of isolating and acting on risk parameters. Thus, we see how this smart technology can deliver direct value to our businesses and impact the ROIs significantly. Enterprise mobility: What’s the right strategy?